Sherwood Forest oaks, Edwinstowe, Notts. IN considering the history of Sherwood forest, it has to be borne in mind that this was only one of the many areas which went to make up the royal forests of England. 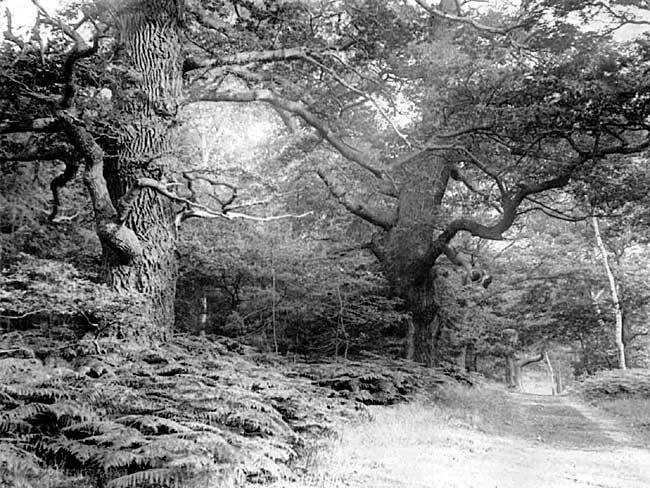 In course of time the word 'forest' has changed its meaning; originally it did not signify an exclusively woodland area as in modern usage; it covered all tracts of land, wooded and otherwise, which had been reserved for purposes of the royal chase, and at least from the time of the Conquest these forests were regarded as the peculiar property of the king, outside the scope of common law. How far the forest organisation existed before the Conquest can only be conjectured, though there exists a code, supposedly enacted by Canute but of doubtful authenticity. The genuine legislation by Canute on the subject is of the simplest. "I will that every man be entitled to his hunting in wood and field on his own possession. And let everyone forego my hunting: take notice I will have it untrespassed on, under penalty of the full wite." The development of the forest took place under the Normans, and a set of forest customs, harsh and cruel, were brought into effect by Henry I. These were highly unpopular with the barons, since it interfered with their pleasures and rights: and also with the ordinary people, on whom most of the cruelty of the law was practised. Turner in his select Pleas of the Forest,1 divides the history of the forests into three main periods: the first from earliest times until 1217, the year of the Charter of the Forest: the second from 1217-1301 when dis-afforestation took place under Edward I; the third from 1301 until the present day—or perhaps more truly until the need of money tempted successive kings to sell the royal forests to various landowners. From an administrative standpoint the English forests were divided into two areas, those north of, and south of, the Trent with a justice of the forest appointed for each area. These justices had subordinate officers under them, some appointed by the king and others by the justices themselves. Next in importance to the justices were the wardens, usually in charge of one forest, although occasionally they controlled a group of forests. Wardens were of two classes, either appointed by letters patent or else hereditary. Usually the warden appointed by the king was at the same time warden of a particular castle within the forest. Even an hereditary warden could be removed from his position, as witness the case of Robert of Everingham, warden of Sherwood, who was deprived of his office in 1287. Below the wardens came the verderers, who were directly responsible to the king, not to their wardens, and were elected in the county court. To qualify as a verderer, a man had to be the possessor of land within the forest, and he was usually a knight or holder of considerable estate. The customary number of verderers was four to a forest, although in the case of Sherwood there were six, receiving neither salary nor perquisites. Their chief work was to attend the forest courts. The foresters came next in order, their numbers varying in each forest, and their importance was measured by their being either riding or walking foresters attended by pages. They were appointed by the wardens and depended upon them for their salaries. Often, however, the appointment was farmed, and so far from the wardens paying their salaries, the foresters bought their appointment, reimbursing themselves by extorting from the inhabitants of the forest regions sheaves of wheat and oats, lamb, sucking pigs and money, dues for assarts, wastes and purpresture. When a forester held his office by heredity, he was known as a forester-in-fee. A forester-in-fee was also entitled to chiminage—a sum of money paid for the usage of a way through the forest. If a man was not a forest dweller, but came in to sell goods, he was exempt, but if he came as a buyer he had to pay. As the king's demesnes formed only a part of the lands within his forest, it followed that within the forest were also extensive woods in private hands over which the owners enjoyed normal property rights. Another group of officials, the woodwards, were appointed by these landowners. They had a double duty to perform; to protect the king's venison as well as their master's woods; in fact they might reasonably be termed private foresters. The three remaining forest officials were the rangers, who were a special type of forester and do not appear officially until the end of the 14th century; the regarders, twelve knights chosen for the special purpose of carrying out a general inspection of the forest every three years on a fixed plan, and from whose accounts the metes and bounds of the forest were checked: and finally there were the agisters, of whom there were usually four in each forest, whose main task was the collection of money for the agistment of cattle and pigs in the king's demesne woods. They appear to have received their appointment from the wardens. To deal with forest offences there were two main courts, the courts of attachment held about every six weeks, and the forest eyre held every few years, varying from three years in the 12th century to seven years in the time of Henry III. The courts of attachment for Sherwood, sometimes called the forty days court, were held at Edwinstowe, Mansfield, Linby and Calverton, and dealt only with minor trespasses against the vert. All important cases concerning the vert or venison had to go before the justices in eyre. Those involved in serious offences were generally kept under arrest until sureties for them could be found; but circumstances might conceivably arise requiring an offender to be kept under arrest for years, that is if his case had just missed a session of the justices in eyre. In the 13th century delinquents were usually fined, and had to remain in prison until the money was paid. If anyone cited failed to appear, he was summoned in the county court, and should he still be absent, was forthwith outlawed. Clauses in Magna Carta dealt specifically with abuses relating to the forests, while the Charter of the Forest of 1217 was concerned, amongst other things, with the abuses which had sprung up since the accession of Henry II and with the offensive forestations made under Richard and John. The severity of the punishments for forest offences had been somewhat modified by Richard I, and it was no longer considered as penal to kill deer as to kill a man. Mutilation, such as blinding, cutting off fingers, hands or feet, was abolished. Offenders who felled trees outside the demesne were attached by four pledges; if a deer was found dead an inquisition was held with the four nearest villages, while the finder was attached by six pledges; if a mastiff was found near a dead beast, provided it was muzzled, the owner was quit. Most of the entries in the records of the attachment courts are of recurring offences, and by repetition not of great interest. To cut an unauthorized sapling cost the offender 3d. in fines, failure by a surety to produce an offender, 2d. ; an oak tree was more expensive and realized a fine of 6d., while stealing a stubb was a luxury at 18d. The following examples taken from the Nottinghamshire Eyre of 13342 illustrate the kind of cases with which it had to deal. Four men were concerned in slaying a deer of whom one, Hugh of Wotehale of Woodborough, was in prison waiting the visit of the justices in eyre, two were at large and could not be found, one, Stephen Henry, was dead. Hugh was pardoned because he was poor, nothing could be done about Stephen Henry, and the missing two were outlawed. 2 From Turner's : Select Pleas of the Forest.